Last Friday night turned out to be a perfect night to attempt getting a picture of the Milky Way. In the low 60s and low humidity for a change. Off to Stowe I went. I still need to learn some of the tricks to this but I feel I am heading in the right direction. That is Mars directly the airplane trace with Waterbury at the bottom left. 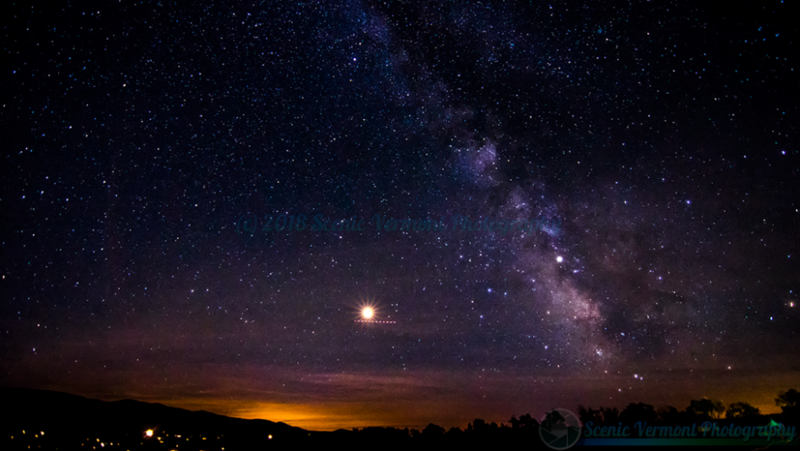 Tagged Astro Photography, Milky Way, Scenic Vermont, Scenic Vermont Photography, Stowe Vermont, Summer, vermont, Vermont Attractions, Vermont Landscape, Vermont Landscapes, Waterbury Vermont.